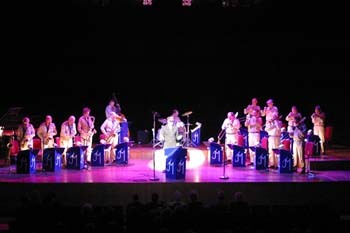 The John Miller Orchestra, formerly The Herb Miller Orchestra, is the only Big Band performing the music of Glenn Miller with direct family links to the great man himself, in the form of John Miller, his nephew. Herb Miller developed his musical talent very much under the guidance of his elder brother Glenn, and went on to form various bands in America. But it was not until many years after the mysterious disappearance of Glenn that Herb decided he wanted to recreate the Miller Magic and form an orchestra to play the music of his brother. Herb had worked in America for many years with his son John, singer and bass player. When they decided to form the Herb Miller Orchestra in Great Britain John became his business partner, and the featured singer with the band. John and Herb built an organization which now contains some of the best musicians in the country. Sadly, Herb Miller died in September 1987. 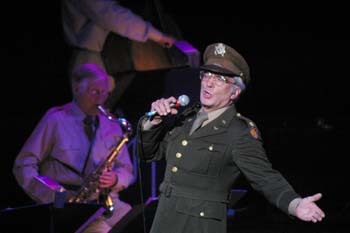 John Miller took over the direction of the band and his unique brand of Yankee showmanship, humour and personality have given it a reputation of "a good time for all" (including the band). John has the uncanny ability to reach a crowd whether it is in the small confines of a smoky bar or the vast expanse of Hyde Park to ten thousand plus. John is joined on stage by vocalist Fiona Paige who is at the centre of the great Modernaires numbers like 'Chattanooga Choo Choo' and 'Kalamazoo'. As Fiona is an ex-dancer, she brings years of professionalism, energy and an extra dimension and definition to the term Big Band Singer. She is a show in herself. To see her is to love her. Book now for your Centenary Celebrations 2014!